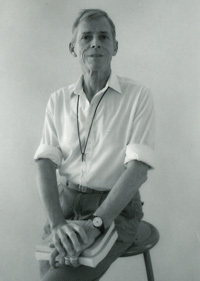 James Merrill, Key West, 1987. Photo by Lawson Little. This recording is available for noncommercial and educational use only. Copyright © 1993 by the Literary Estate of James Merrill at Washington University, used with permission of The Wylie Agency LLC. I’d like to use JM’s readings in my upcoming course on Post WWII American Poetry. Please do, Karl, it’s a beautiful reading. We’d love to hear about your students’ reactions.